One thing the Freelancers were known for in the mid to late years of the corps' existence was changing uniforms more often than some corps seemed to change the tires on their buses. 1982 still featured the basic Freelancers look of a red cadet military jacket, and in that unmistakable look, the group kicked off its '82 production with a hyped two-minute rendition of Stevie Wonder's "You are the Sunshine of my Life." 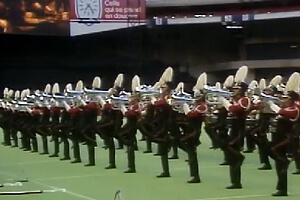 This opener was typical of the California corps' style through much of its existence; peppy, happy and full of spirit, though the group also had no problem switching to symphonic music from one year to the next. During the drum break in the opener, which is featured in the following video clip, note the split-shell snare drums. This was one of the short-lived innovations experimented with by a number of corps for the purpose of increased sound production. "Recuerdos" ("Reminiscences") from Stan Kenton's "Cuban Fire!" album followed, offering the corps a chance to be more laid back, with the drill in a gentle and continuous swirl from side to side. "Genji" followed, an upbeat Asian-tinged jazz work. A short drum feature of Emerson, Lake & Palmer's "Toccata" (from the album "Brain Salad Surgery") was based on the fourth movement of Albert Ginestera's "Piano Concerto No 1." The drum line re-created the solo percussion feature ELP drummer Carl Palmer wrote for the work. Peformance excerpt from the Freelancers' 1982 production. Brought back from the group's 1981 production, Barry Manilow's gentle ballad "Even Now" finished the show. After dissipating to a far corner of the field, the brass section returning to the center and packed into a tight interval for one last big statement. When the corps went inactive after the 1994 season, the Freelancers name came back as a Winter Guard International indoor marching percussion line in recent years, and also lately as a small ensemble at the Drum Corps Associates World Championships. This week only, you can save on 1982 World Championship Audio and Video Performance Downloads on the DCI Fan Network. Buy the 1982 Freelancers Video Performance Download. (Available this week only for $3.99. Regular price: $4.99.) Buy the Audio Performance Download bundle of all 12 Finalists from 1982. (Available this week only for $15.99. Regular price: $19.99.) Offer ends Monday, May 16 at 8:30 a.m. ET.